Final touches are underway on Sunday’s first-ever Bermuda Food Truck Festival and the Bermuda Tourism Authority [BTA] has made a few tweaks after receiving feedback from stakeholders in the local tourism industry. Most notably, hotel concierges have requested, on behalf of visitors, that a health-conscious food provider be added to the line-up of vendors. In response, the BTA included BiteBM Food Truck in the festival. BiteBM Food Truck, which began operation six months ago, approached the BTA earlier in the week looking to cater to consumers who want a local farm-to-table experience at the festival. Given the feedback from concierges the BTA asked Bite’s owners to fill the heath food gap identified by the hotel industry. They agreed to do so. Grilled fish, pumpkin rice, local produce and vegetarian dishes are expected to be on the menu. BiteBM Food Truck will join 14 other food trucks and pop-up vendors on Sunday, October 9 from 1:00pm to 6:00pmat the No 1 Car Park on Front Street. Some of the vendors have large followings of loyal customers and are practically household names in Bermuda’s food culture. For example DeGraff’s Lunch Counter began as a horse-drawn wagon in 1939. “It’s exciting to have a well-established food truck like DeGraff’s Lunch Counter, almost 80 years-old, alongside a new outlet just getting started,” said Glenn Jones, director of public and stakeholder relations at the BTA. 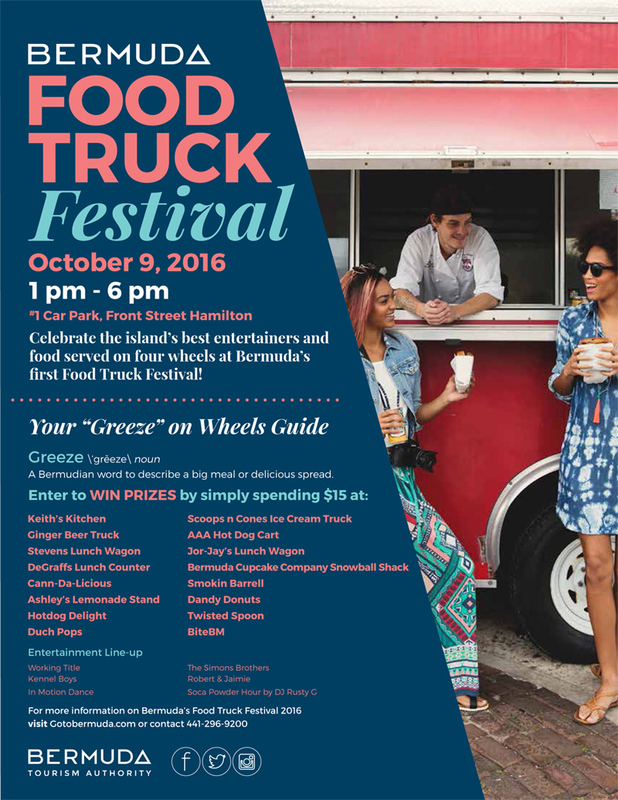 Bermudian Chef Fred Ming will be on-hand to engage with visitors and locals about the island’s food traditions. The line-up of local live entertainment includes the Simon Brothers, In Motion, Kennel Boys, Robert & Jaimie and Working Title. DJ Rusty G will bring an hour-long soca celebration during the festival. Confirmed Vendors are AAA Hot Dog Cart, Ashley’s Lemonade Stand, Bermuda Cupcake Company & Snowball Shack, BiteBM Food Truck, Cann-Da-Licious, Dandy Donuts, DeGraff’s Lunch Counter, Duch Pops, Ginger Beer Truck, Hot Dog Delight, Jor-Jay’s Lunch Wagon, Keith’s Kitchen, Scoops n Cones Ice Cream Truck, Smokin Barrel, and Stevens Lunch Wagon. Looks like we have a lot of morbidly obese “dislikers.” #truthhurts? I am glad to see a healthy option will be included as not everyone wants to eat burgers and fries! Looks like a fun event for all! “Let me hit up the Food Truck Festival for a nice healthy salad” said no one ever. Go enjoy your greaze people!